Global Brokers offers a complete line of residential and commercial glass hardware. GB has been supplying shower door hardware to some of the largest Shower Door manufacturers in the industry for the last 10 years. 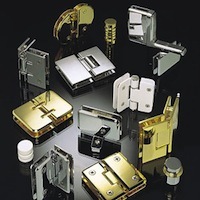 If you are a volume user of glazing hardware Global Brokers has the right product and package to fit your needs. With over 35 years of combined shower door experience Global Brokers has the knowledge to take your shower door program to the next level or help you build it from the ground up. The heavy glass shower door market is a large part of the overall glazing industry landscape and a very profitable one at that. Many of the largest shower door companies in the industry have benefited from Global Brokers expertise to help implement a solid shower door foundation. 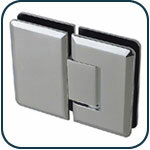 Shower door hinges offered in a variety of styles and colors. All hinges are offered with 5* pivot pin, internal pivot block bumpers, color choice on gaskets, and choice of back plate screws. 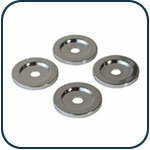 Shower Door clips offered in a variety of styles and colors. 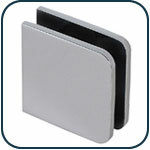 Available with square or beveled edges as well as your choice of gasket color. 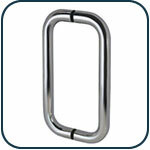 Shower Door handles offered in a variety of styles and colors. Available in a multitude of sizes, shapes and thicknesses to suit all needs. 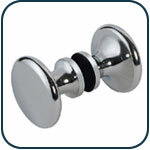 Shower Door Knobs offered in a variety of styles and colors. Available to fit most shower door applications. 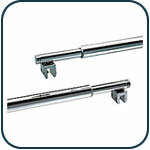 Shower Door headers offered in a variety of styles and colors. Available for all configurations and glass thicknesses. Shower Door accessories in a variety of styles and colors. Numerous choices to aid and accent our entire hardware line. "Global Brokers are the type of company that stands behind what they sell. You can trust that they will treat you right."